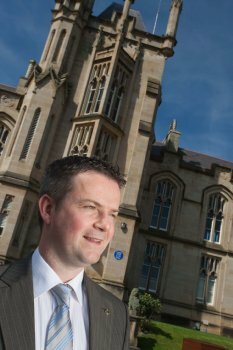 Dr Malachy Ã“ NÃ©ill has been appointed Head of the University of Ulster’s new School of Irish Language and Literature which has its headquarters at the Magee campus. An award-winning teacher and passionate advocate of the Irish language, Dr Ã“ NÃ©ill joined the University of Ulster as a Lecturer in Modern Irish in 2008. He was previously Head of Irish at St Mary’s Grammar School, Magherafelt and has been associated for many years with the work of Gael Linn in schools and with ColÃ¡iste Mhachaire Rabhartaigh, their Gaeltacht summer college in County Donegal. He continues to contribute to the work of Gael Linn in their courses for adult learners of Irish at Gweedore. Dr Ã“ NÃ©ill has a strong association with the University of Ulster having completed both his undergraduate studies and his doctoral research at the Coleraine campus. He also lectured in Irish on a part-time basis in Belfast and Coleraine while completing his Ph.D.
Hailing from Ardboe in County Tyrone, Dr Ã“ NÃ©ill played a key role in establishing the first Irish medium nursery school, NaÃ­scoil Eoghain, in nearby Cookstown in 2008. Following its success a new Irish medium primary school, Gaelscoil Eoghain, is due to open in September. Dr Ã“ NÃ©ill is a governor of the new school and completed his first marathon earlier this month to raise funds. His major research interests are the Ã“ NÃ©ill dynasty and various aspects of the teaching and grammar of Modern Irish. He was editor of An tUltach, the official magazine of Comhaltas Uladh, from 2007 until 2010 and recently became the Irish Language Editor of DÃºiche NÃ©ill, the Journal of the O’Neill Country Historical Society. He contributes regularly to Irish language programmes on Radio Ulster and RaidiÃ³ na Gaeltachta, and is the Language Advisor for the forthcoming BBC/TG4 production of Wolfland - TÃ­r na Mac TÃ­re. Dr Ã“ NÃ©ill’s appointment marks the launch of the new School of Irish Language and Literature which will offer courses at the Magee and Belfast campuses. “This is a major vote of confidence from the university in the Irish Language. The University of Ulster is the major provider for Irish language courses throughout the North of Ireland,” said Dr Ã“ NÃ©ill. The new School of Irish Language and Literature will work closely with the Irish and Celtic Studies Research Institute, headed by Professor Ailbhe Ã“ CorrÃ¡in, which also has its headquarters at the Magee campus. Research in Irish and Celtic Studies at the university is rated in the top three across all UK universities in this subject area. Dr Ã“ NÃ©ill added: “Our aim is to deliver teaching and research which will not only impact positively on the local population but also contribute significantly to international scholarship.